This piece is based on our conversation with Genevieve Quist Green, Consulting Manager, and Melissa Galvez, Senior Editor for Content and Distribution, at Education Resource Strategies (ERS). Before joining ERS, Genevieve was the Massachusetts Policy Director at Stand for Children and a middle school English teacher in Los Angeles. She also holds her Doctorate in Social Policy from Oxford. Melissa previously taught English with Teach for America in Houston and has worked with several education non-profits. She holds her Master of Public Policy from Harvard’s Kennedy School of Government. ERS is a national non-profit that partners with district, school, and state leaders to transform how they use resources (people, time, and money) to prepare every child for tomorrow. What Can We Learn From The Fastest Improving Schools? In this piece, we’ll be reviewing some of the key findings from ERS’ report: Designing Schools That Work. You can check out the full report here. You can also check out the new Get Started section on the ERS website where you can explore tools, worksheets, videos, and briefs on each of the topics we cover below. Note: This is a recently updated graphic depicting ERS’s Strategic School Design – one should be aware that the wording has changed slightly from the original 2017 report. To maintain consistency with the original report, we use the language and terms contained in it. 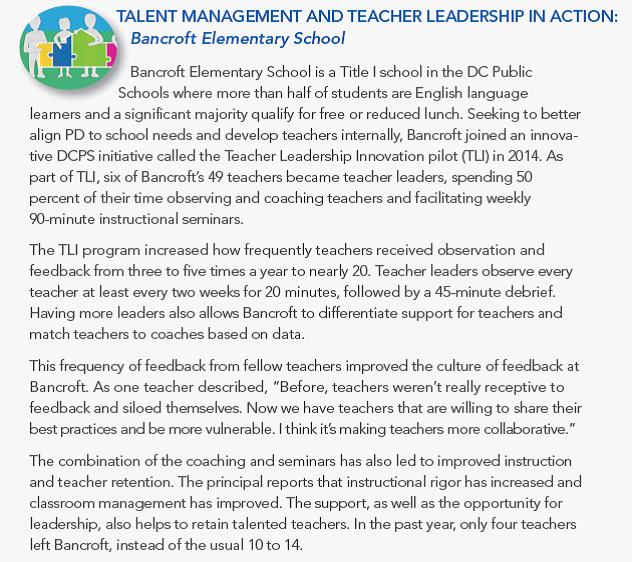 In this piece, we’ll take a deeper look at the four components that are most closely linked to a school leader’s decisions around people, time and money – Expert-led Collaboration and Professional Learning, Talent Management and Teacher Leadership, Personalized Time and Attention, and Responsive Learning Community. While we will set aside the two remaining components – Empowering Curricula, Instruction, and Assessment and Growth-oriented Adult Culture – for now, it should be noted that both are very important. The curriculum a school or district selects will clearly shape decisions around the delivery of instruction, and the culture of an organization permeates throughout everything it does. We’ll examine these two essential in greater depth in a future piece. Finally, it should be noted that these design essentials are dependent on each other. For example, you can’t have expert-led collaboration without experts on campus. And you can’t have true content experts if you haven’t built the systems for talent management and teacher leadership. One of the most significant reasons that teachers rate PLCs poorly is the lack of highly specific support for their content needs. And one of the reasons for this is that schools lack enough content experts that can skillfully navigate the more rigorous demands of the Common Core standards. What’s the solution? 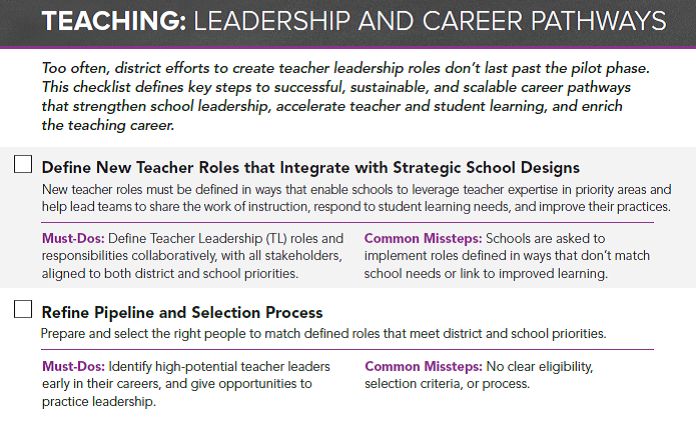 Over time, schools need to plan for and invest in well-designed teacher leadership roles with teachers who are highly specialized in their content areas. As you can imagine, this also allows for the creation of strong career leadership pathways. We previously covered how one school network, KIPP-Austin, designed their Teacher Career Pathway. You can read Part 1 and Part 2 of that piece here. Put another way, a key part of managing talent is organizing well-defined teacher leader roles for vetted content experts who support collaboration and growth-oriented feedback cycles across teams. ERS has found that these new positions are most effective when teacher-leaders become highly specialized in their content areas, are given enough time to complete their newly added leadership responsibilities, and are connected to an integrated development model (where the same individual providing coaching support on content is the same person who is coming into the classroom to coach). ERS provided us with several additional resources for schools to explore when considering their leadership and career pathways. Stay tuned! Later, we’ll share a follow-up piece that covers ERS recommendations on the final two design essentials – curriculum and growth-oriented adult culture.